Most people enter a business partnership with the expectation that that everyone involved will behave with responsibility and a reasonable attitude. Unfortunately, that is not always the case. 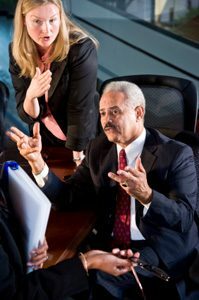 If you are facing a partnership dispute or anticipate that a dispute is inevitable, it is essential that you have an experienced Los Angeles business litigation lawyer on your side to protect your interests. With over 25 years of experience in business, intellectual property and copyright legislation, business attorney Robert G. Klein can work with you to find a solution to your partnership or business dispute. You’ve done your part for the business, and you’ve watched it grow into what it is today. You don’t need a negligent or irresponsible partner to endanger everything that you have worked so hard to accomplish. When you have an experienced business litigation lawyer on your side, you may be able to avoid a long and drawn out trial. Many partnership disputes can be solved through negotiation and mediation, and the situation won’t be brought before a jury that may not understand the nuances of a business relationship. More importantly, your business litigation attorney will be able to ensure that you are represented fairly and aggressively in the proceedings. Depending on the circumstances of your case, you may even be able to get your partner to sign a non-compete agreement to prevent him or her from being able to compete unfairly against your business. Los Angeles business litigation lawyer Robert G. Klein has over 25 years of experience in business law. When you suddenly find yourself facing a business dispute with a partner, it’s essential that you have experienced and knowledgeable legal counsel to guide you through the fight and get you the settlement or verdict you deserve. When you contact our law firm, your case will receive the attention of a business attorney who has helped hundreds of businesses just like yours get through treacherous legal battles.